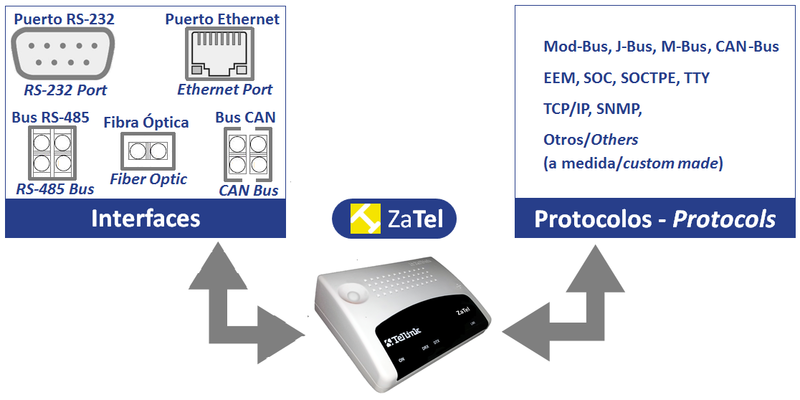 ZaTel range of protocol converters has been designed to enable remote management of devices whose interfaces and communications protocols are not compatible with those used by control centers. The need of interface and protocol conversion is very common in M2M environments as there are often not fully defined standards, and sometimes device manufacturers choose to use proprietary protocols. In the simplest cases, it is only a conversion of physical interface, but the most common cases ZaTel converters must also perform the conversion of network routing protocols. There are different versions of ZaTel, depending on the physical interfaces and protocols that are required. The table above shows the various physical interfaces as well as communications protocols available. Additionally, Tellink offers the possibility of developing new customized protocol converters as part as its ZaTel offering.